Mount Gilead’s Madison Fitzpatrick goes up for two of her team-high 12 points in Thursday night’s sectional basketball contest at home with Columbus Academy. Samantha Sullivan works inside for a shot attempt in action from Thursday. 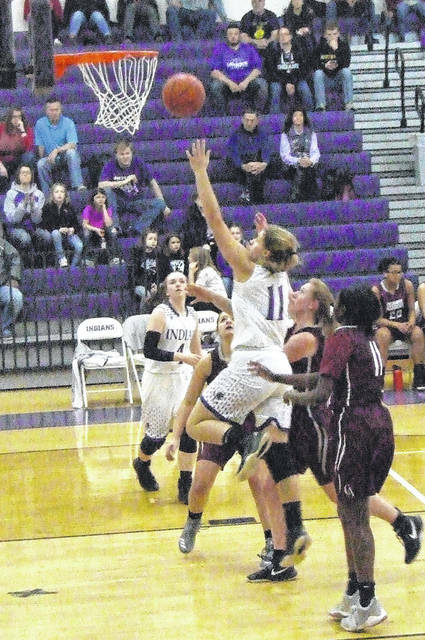 In a game of runs, an extended cold streak proved fatal to the Mount Gilead girls when they hosted Columbus Academy in the sectional tournament opener for both squads Thursday night. After Madison Fitzpatrick hit a basket, drew a foul and sunk the free throw to increase a slim MG lead to a 24-19 margin to open the third quarter, the Indians would not score from the field the remainder of the game. While their defense kept them in it for the rest of the third and early stages of the fourth, Academy eventually pulled away for a 45-30 win. Both teams had their share of droughts during the game. A three-pointer by Holly Gompf and basket from Dakota Shipman gave MG an early 5-2 lead, but the team went five minutes without scoring, allowing their opponents to score 11 straight. Trailing 13-5 with a minute remaining in the opening period, the Indians got a boost from Fitzpatrick, who scored six points in 44 seconds. 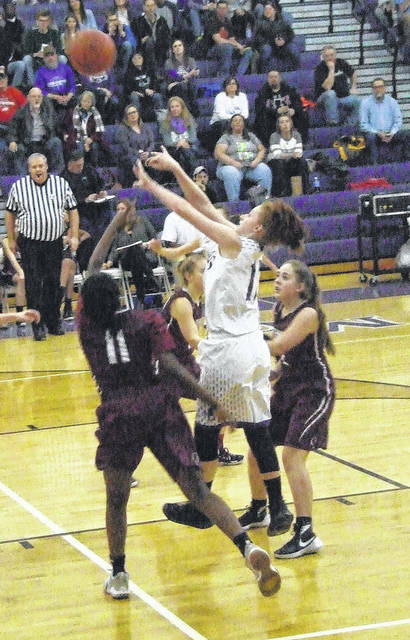 While Academy tallied a pair of free throws after getting fouled on a buzzer-beating three-point attempt, Mount Gilead was still within a 15-11 margin after eight minutes. They would take that momentum into the second quarter, getting a three-pointer from Baylee Hack and two points each from Fitzpatrick and Gompf to go up by three. The Indians led 21-19 with five minutes remaining in the half and, after neither team scored during that time, held a two-point lead going into the half. Fitzpatrick increased that lead to five early in the third, but Academy scored eight straight to surge in front by a 27-24 margin. MG finished the period on a 3-1 run, getting two free throws from Samantha Sullivan and one from Hack to close within one. A free throw by Sullivan to open the fourth tied the score at 28, but Mount Gilead could only get two points, both on free throws, over the final 6:30 of the game. During that time, Academy scored five times from the field and hit 7-of-9 free throws to pull away for the win. Fitzpatrick led Mount Gilead with 12 points. After finishing 9-14 and expecting to return everyone, with the majority of his squad being sophomores and freshmen, Stover feels his squad has the ability to continue improving greatly over the following seasons.